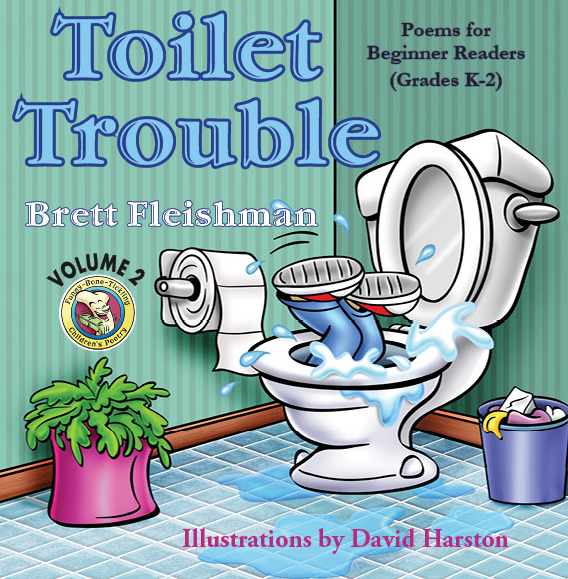 Home Author Interview Interview with author of Toilet Trouble and more, Brett Fleishman! 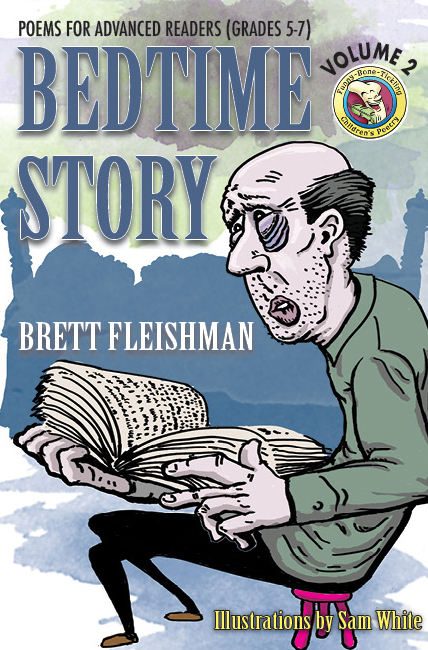 Sudbury, MA – Acclaimed author Brett Fleishman has returned for more giggles, snorts and full-bellied laughs with his latest collections of poetry for kids. Three new volumes out November 8 are sure to entertain – and educate – kids of all ages: Toilet Trouble for beginners, Take A Hike! for intermediate readers, and Bedtime Story for the advanced. Each book includes bold and expressive illustrations to complement Fleishman’s signature quirky wordplay. His use of puns and idioms at the end of poems is a fun puzzle for both children and adults! 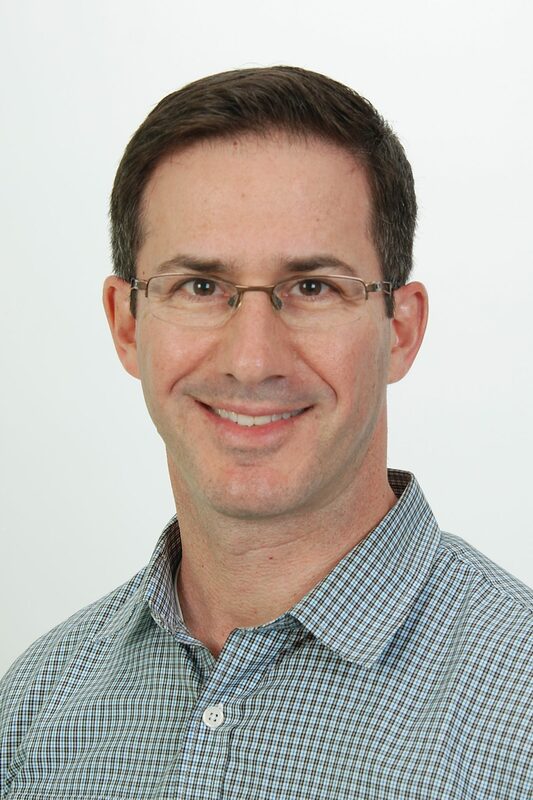 BRETT FLEISHMAN: Brett Fleishman grew up in the suburbs of Philadelphia. In 1995, he earned his B.A. In 2001, he earned his M.B.A. At no point did he earn a roster spot in the N.B.A. Brett lives with his two sons, Jacob and Dylan, in the greater Boston area. (Please note that, while Brett and his sons enjoy living in Boston, their sports allegiances remain firmly Philadelphian.) To learn more, please visit www.brettfleishman.com. You can also follow Brett on Facebook (Funny Bone Tickling Poetry) and Instagram (@funnyboneticklingpoetry). A collection of 20 humorous poems designed for beginner readers (grades K-2). Volume 2 of this series includes a reunion of the Big Bad Wolf and the Three Little Pigs, a surprise birthday present for a baby crocodile, an uninviting hole in an ice skating rink, and much, much more! 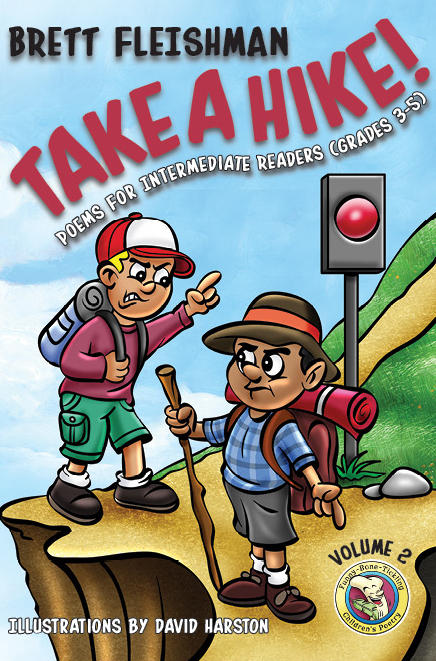 A collection of 25 humorous poems designed for advanced readers (grades 5-7). Volume 2 of this series includes a poorly planned Treasure Hunt, a rather chaotic manure machine, a very competitive laundry-shooting game, and – you guessed it – much, much more! How do you put yourself in the mind of a child? Well, I’d be lying if I said I was the most mature 44-year old on this planet! Before I write a poem, I always ask myself two questions: “What topic would a child find entertaining? What ‘twist’ can I employ to make the child laugh and have an ‘aha’ moment?” In Toilet Trouble (Volume 2 of my beginner series), I include a poem about a very old Big Bad Wolf who has returned to the brick house of the Three Little Pigs. The Three Little Pigs aren’t scared, of course, because the Big Bad Wolf is now way too old to huff and puff and blow their house down. But the pigs seem to have forgotten that they left the key to their house in the knob of the front door. Oops! During my childhood I was completely fascinated by Shel Silverstein’s poetry books, especially Where the Sidewalk Ends. His quirky poems and crude illustrations were always incredibly captivating to me. One of my all-time favorite books is The Phantom Tollbooth by Norton Juster. While this fantasy adventure alone is highly entertaining, I love how intelligently the author weaves puns throughout this novel. I also use puns (and idioms) in my intermediate and advanced poetry books, which I hope readers will find equally appealing. How do you write poetry that manages to entertain both children and adults? While my poetry is primarily designed for children, I believe there are educational components of my work that adults will find entertaining, too. I love to “trick” readers by using puns and idioms at the end of the poems unexpectedly. In Twist and Shout! (Volume 1 of my intermediate series), I include a poem called 20 Bucks. In this poem a kid promises to give one of his friends 20 bucks if he or she can answer four consecutive questions correctly. When one of his friends finally does, instead of giving her 20 dollars, he ends up giving her 20 deer. I believe this educational angle is important. Also, in my intermediate and advanced books, I include word puzzles that both children AND adults find challenging to solve! How do you differentiate between what will work for a young child and what’s a better fit for an older child? The factors that determine which poems will work best for which age groups include 1) length of poem, 2) difficulty of vocabulary, 3) difficulty of content, and 4) use of word plays. Short poems (approximately 40 words) that use simple vocabulary and easy-to-understand content typically work well in my beginner series (grades K-2). Longer poems (approximately 100 words) that use more challenging vocabulary and content, and also employ sneaky wordplays, work well in my intermediate series (grades 3-5). The longest poems (typically 200+ words) that use the most challenging vocabulary and content, and also employ sneaky wordplays, work well in my advanced series (grades 5-7). How do you come up with your puzzles? I’m not sure what is more difficult: creating Zany Word Blenders (me) or solving Zany Word Blenders (kids and adults alike)! Though these puzzles are created from actual rhyming poems (in the form of limericks), I have quickly learned that very few people are interested in the poetry since they are so fixated on solving the puzzles. The goal of my Zany Word Blenders is to find a “hidden” word in each of the five lines of the poem. Each “hidden” word blends together the last letters of one of the words in the line with the first letters of the subsequent word in the same line. For example, “I love to write poems!” has the word “veto” hidden in it. Coming up with a theme for each puzzle is easy. Coming up with the hidden words and doing so in the format of a limerick is quite difficult! Why do you think it’s so important for kids to be exposed to poetry? I think poetry – and rhyming, specifically – is an excellent way of engaging very young children who are not yet capable of reading independently. Though poetry is also invaluable for children who are already reading independently, since this form of literary expression helps them understand many subtleties of the English language. Where are you from? / Tell us a little bit about yourself! I have an atypical background for a children’s poet. I didn’t study poetry or major in English in college. I studied economics and finance. I work full-time in the financial services industry and write poetry whenever I have down time (which isn’t often enough!). Four years ago, I wrote my first poem and shared it with my then 8- and 10-yr-old sons. They thought the poem was pretty funny, and I really enjoyed writing it, so I decided to keep writing poems. Outside of writing children’s poetry and working full-time, I love spending time with my boys and playing competitive tennis. Unlike many authors, I didn’t have a specific plot for a book in mind when I started writing. Instead, after writing my first poem, I just kept writing more and more poems. Like, a lot of poems. Over a two-year period, I wrote 1,000 poems. Each of my six books is a collection of humorous poems that are designed for children at different reading levels: beginner (grades K-2), intermediate (grades 3-5), and advanced (grades 5-7). The intermediate and advanced books also contain word puzzles and employ lots of word plays (think puns and idioms), so there is a real educational component to these books. Last year, I published my first three books (Volumes 1 of the beginner, intermediate, and advanced series). In November 2018, I am releasing the next three books (Volumes 2 of the beginner, intermediate, and advanced series). So how did I get started? Well, four years ago I was going through a stressful personal situation. I think when I wrote that first poem, I was looking for an outlet, a distraction from the stress. Writing children’s poetry was an incredible outlet for me. Prior to that point, I had never written a poem. I love that I discovered a talent that I never knew existed. And I love sharing this story with students at elementary schools. I always tell them that they, too, may have a hidden talent. Maybe they are really good at something but they simply haven’t discovered what it is yet. Their faces light up when they consider this possibility. It’s hard to describe what a great feeling that is — not just for the students, but for me, too. My poems are in the general mold of Shel Silverstein’s poems. The beginner and intermediate poems average less than 100 words, so there is less opportunity for character development with these poems. Instead, I spend my time thinking about silly topics and what would make children laugh, topics like a boy who uses his inhaler too much and eventually pops or a girl who controls the moon by flicking a light switch with her nose (while another girl is doing the same thing from another house, but she’s controlling the sun instead). I actually love character studies in movies. If I were writing novels rather than collections of poems, I would have much greater character development. What inspires / got you started in writing? I started writing children’s poetry when I was searching for an outlet to take my mind away from a stressful personal situation. Writing children’s poetry was a much-needed distraction. I found it very calming. My poems are inspired by children. I am 45 years old, but am a kid at heart. I like to laugh and I really like to make other people laugh. Before I write a poem, I think about two things: 1) what topic would a child find entertaining, and 2) what spin can I put on that entertaining topic that will make it funny for the child reading it. Whether it’s a poem about a kid falling into the toilet because has assumes incorrectly that his sister will put the toilet seat down (since she always does, but refuses to do so in order to teach him a lesson, or a poem about a baby crocodile who is excited after she gets her birthday present, which just so happens to be a pair of crocs (the shoes, not the reptiles), my goal is to think of topics that children will find amusing. Where do you write / Is there something you need in order to write? Anywhere and everywhere. I often think of poem ideas (and start writing them in my head) while commuting back and forth to work. I’ve thought of poems while attending my boys’ sports activities (please don’t tell them that!). I’ve come up with parts of poems during competitive tennis matches. Once an idea gets in my head, I have a lot of trouble putting it aside. Thankfully, writer’s block has not been an issue for me. So far, at least! How do you get ideas for writing? I love sports and am a huge Eagles fan. So I read pretty much anything about the Eagles. I really like an author named Richard Russo, who has written some awesome novels with great character development. I was a HUGE Shel Silverstein fan. I generally like anything funny or clever or with great character development. I also prefer fiction over nonfiction. What would your advice be for authors / aspiring authors?